I am disappointed by this book. The paper quality does not do justice to the photos. Colors and defintion are washed out. Furthermore, while I only skimmed through the book I noticed several typos. I was also surprised to see the Taj Mahal and Hong Kong and a lot of other very cool places ommitted, while Florida (!) was included. 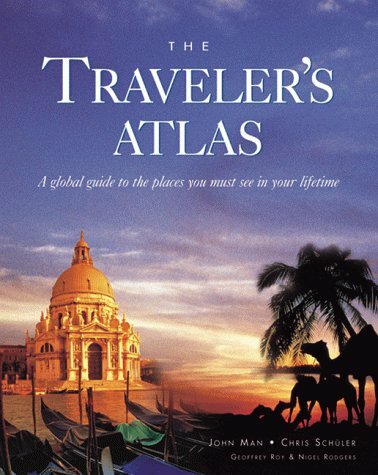 This book sets forth the 47 places that you must visit in your lifetime. I am working on visitng all 47 places. Since I first reviewed the book some three years ago, my wife and I have visited six of the places--Tanzania, the west coast of Norway-the world's most beatiful voyage, Costa Rica, the Great Wall of China, the Yangtze Gorges and the Outer Hebrides. This is a wonderful book and makes a great gift. This is the book I was looking for to give my mother for Christmas. I wanted something about world travel, with beautiful pictures, descriptions of places, and geological maps. This book has that and more. In addition to these things, the book has a sidebar of facts on each place, summarizing climate, local language, currency, best time to go, health concerns and other useful information. There is also a world climate map in the front of the book which labels each area covered in the book. The photography is excellent and I think the coverage is fairly well-rounded. The book opens with information on Banff National Park in Canada, proceeds around the globe in a more or less eastward direction and finishes in the Pacific with Tahiti and Easter Island. A large spectrum of travel is covered, but there are some notable places missing. The authors left out some great cities in Europe, although they do cover Venice, Prague, Vienna and Krakow. These are all beautiful cities and deserve their place in this book, but absent are Paris, Rome, Athens, and London. It's easy enough to find books on these places though and I suspect the authors overlooked them for this reason. One place conspicously absent, which I cannot forgive them for overlooking is the Caribbean. I may be biased, but I do think the Caribbean is one of the most beautiful places on earth. Any well-traveled soul must see at least one of the islands of the Greater or Lesser Antilles. In spite of this, I still give the book 4 stars and feel that it is a wonderful place to look for travel ideas or to do some world exploration from the comfort of an easy chair. There's no doubt that this is a beautiful book. How disappointing, then, that it could have been so much more beautiful were it not for the largely useless guidebook-style writing. What I had hoped for was a gorgeous photo-essay to inspire my future travels with places in the world that are not to be missed. What I got was a book with a split personality: one, a handsome book that belongs on a coffee table, the other, an overly ambitious guidebook to the world with no depth and mediocre writing. If only the authors had chosen one personality to go with (preferably the coffee table one), it might've worked. The problem with the guidebook strategy is that no one is going to use this as a guidebook-the dimensions, hardcover binding, and shallowness of content make that impossible. Therefore this information goes to waste, and the sacrifices that it requires, such as having text in every margin instead of full-page pictures, do the book much damage. That the suggested places tend to be overly broad is a significant weakness. Amazingly, one of the featured places is actually the entire state of Florida. Not that Florida isn't lovely, but such a broad notion of a must-see place is hardly compelling to me as a traveler-It's not like I haven't heard of Florida before, and it doesn't give me any new ideas or highlight anything is sufficient depth to make it seem exciting. This lack of focus pervades the book, as the cities of Vienna, Prague and Warsaw are lumped together as another single destination. Still, despite these shortcomings, I do enjoy looking through the book. The selection of places are varied and well distributed around the world, and some of the photos really are breath taking, and so on the coffee table it remains. Throughout my 10 year interest in Route 66, I've read just about every guidebook there is that will get you from Chicago to Santa Monica. Hands down, Here It Is! The Route 66 Map Series is not only the best bang for your buck, but it's also the most accurate. Sure, fancy slick pages with nice color photos are nice to look at in most guidebooks on the market, but they won't do you much good when they misdirect you. Jim & Jerry have created the standard all guidebooks should follow. It got us there in the end! The maps as a whole were very good but unless you have travelled Route 66 before and know the road well some of the directions were very vague in places and it was up to us to guess which way to turn (and possibly got lost)! With some guess work and with the help of the maps we managed to completed Route 66 with no worries! Just back from nine-day trip from Chicago to Southern California on Route 66. This set of maps was our main guide to The Mother Road. Artwork seems crude, but when you get out there and start driving you'll find that it's generally sufficient, and when you get in trouble (translation: Lost, it happens to all of us sometimes!) the written description is enough to get you back on track! "It's Here" was the comment from 2 young guys touring Route 66 that bought the maps at Lucille's. Lucille said they sat in her drive way and looked up several places they wanted to see and were thrilled that everything was on them. So.. It's Here perfectly describes "Here It Is", a project thoroughly and accurately covered. Don't do Route 66 without it! I thought the National Geographic World map was pretty good, until I boght the DK version. As with almost everything DK, it is simply the best. The information is complete, well presentes and easy to follow. Don't let this book's massive size put you off. It is worth every penny and more. If you're looking to find a specific small town in Europe or Africa, the Times Atlas is better because more of its pages are devoted to road maps and the maps are more cluttered. This DK atlas devotes many of its pages to physical geography, inset explanations of interesting phenomena (e.g., Niagara Falls), and satellite photos. The night-time satellite photos are very useful because they show population density. 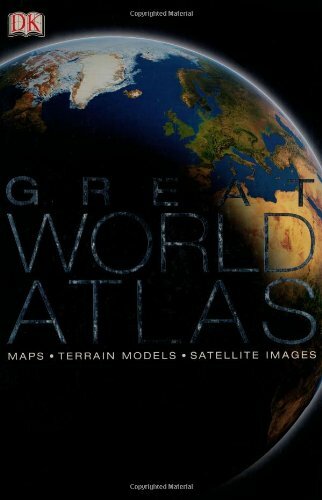 The Great World Atlas is nice for planning trips, figuring out whether a potential vacation spot is near interesting geographical features such as a group of hills, and thinking about regions of the world. 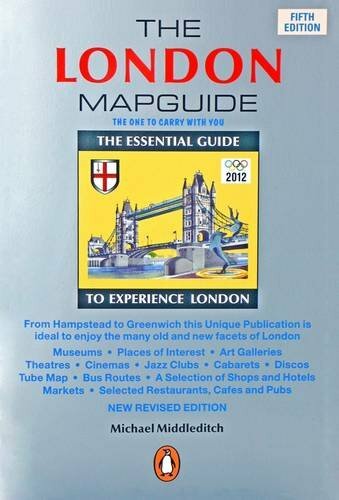 Newly revised and updated, this convenient guide is the essential companion for visitors to London in the new century. Featuring colorful, informative, easy-to-handle maps that require no unfolding, the guide gives a comprehensive overview of what to see and do in and around England's capital city. AMAZING. Such a small book, already worth the piddly amount I paid for it and I haven't GONE to london with it yet. It it extermly detailed, showing train sations, routes, bus routes and route numbers, underground map and stops onthe street map, shows bars, restruauntts, cinemas, theatres, cultural, churches, tourist, sites walking tours, the works. it's a full city map - two pages at a time, I think if it were printed as a whoel page it would be a HUGE map, scale is 6" to one mile, so that should give you an idea of what kind of detail it has. Want to see what's north of yoru page? go to the page number listed, there you go! Along that edge it shows the bus routes going to that new page - JUST AMAZING. I know I won't be able to LIVE without this map while there. Parks, monuments, cemetaries, museums - all of it. We loved this map book! The London Mapguide was indispensable during our recent trip to the city. Each page's map is jam-packed with information: sites, museums, post offices, parks, hospitals, churches, and even select pubs, restaurants and clubs. Aesthetics are important to me, and I can vouch that this guide is very well put-together, colorful and easy to read. Also, the book handily has pages at the beginning and end with plenty of info about museums and other sites, including hours of operation, their map location pages, pricing, etc. as well as emergency numbers, service info important to tourists, a large Underground map (yes, the famous one) and a fairly comprehensive index of street names. The most unexpected benefit of the guide was how handy it was for figuring out the public transportation system. We bus-hopped all over London using this guide alone, seeing much more than we would have if we had just taken the Underground. The maps very clearly illustrate all of the bus routes and Tube/railway stops and it's super easy to trace how to get from one part of the city to another, seeing as much as possible along the way. We used this map guide so much during our stay in London that it feels like as much a memento as anything else we brought home. Just flipping through it now brings back a lot of memories. Another reviewer complains that this guide doesn't cover a very extended area, and while it is true that it doesn't include maps for the outer fringes of London, it covered a perfect area for we tourists spending a week trekking all over the city's heart. I strongly recommend this guide! Just got back from a wonderful vacation. This mapguide was incredibly helpful in finding all the locations I wanted to go to. More importantly for anyone who travels a lot and likes to wander and explore, you can easily figure out where you are and then where to go to catch the tube or bus. It is compact and handy. I cannot recommend this enough. The details for a city known for it's complexity make this invaluable. I went to London with this map book and some general guidebooks two years ago. The maps in this book were incredibly useful and detailed -- better than any of the other books' maps, without question. Sounds silly to say, but I can't believe how much I appreciate the fact that even hotels are marked on its pages! Helps when you're planning your next trip, too! You will not regret buying this. I found this map book extremely helpful on my recent stay in London, particularly the information on bus routes. I would never have had the courage to take buses, and I am glad the book gave me the info I needed to do so without fear of getting lost. The tube may be quick, but there is nothing like sitting in the front topside of a double-decker bus to really see London! I found the dimensions of the book somewhat awkward, and I kept wishing it was skinny enough to stick in my back pocket, since I wasn't carrying a bag. As is, I was always having to hold it, and therefore afraid of losing it. But all in all, you couldn't ask for more information, or a clearer map of an often confusing city. 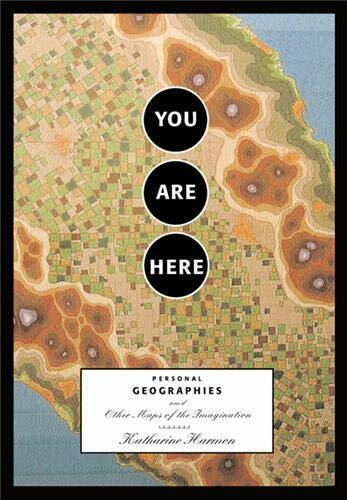 This is an excellent reference book that covers a myriad of geographical locations. The maps are also excellent. I highly recommend this book. A previous reviewer claims that the editors made an egregious mistake by including Slovenia as part of the Balkan states. Maybe that person should do a little research because virtually every resource, including Microsoft Encarta, includes Slovenia in the Balkans. And yes, the Ottomans did conquer Slovenia. The Ottomans had to surrender Slovenia, Hungary, and Croatia to the Hapsburgs in 1699. The editors of this book got it right on the money. As for that reviewer -- a little knowledge is a dangerous thing. 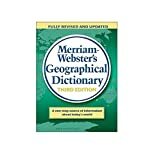 This dictionary is especially useful for writers and editors who, perhaps on tight deadlines, need to check spellings and other general overview information or find out where a river, bay, mountain range, or other natural feature is located. Many small, obscure locations and features are not included, likely because the publisher had to decide between utility and thoroughness, and utility won. And this utility is, in fact, the strength of this publication. One should not purchase it instead of, but in addition to, an atlas. That's why I consider the functionality of this dictionary to be like a Leatherman tool: it will not do everything, but it's the best single resource of its type. Merriam Webster's Geographical Dictionary is an excellent source of information on more or less important places. It has everything a geographical dictionary should have - very good concise descriptions (icluding all important historical data! ), and useful maps (contributed by Encyclopaedia Britannica), especially those of the states of the USA (because of the borders of all counties shown on each map). It's not surprising that in such informative book there are some mistakes, but despite that it's still definitely one of the most authoritative geographical dictionaries available, and is worth every single penny or cent (just like its twin brother Merriam Webster's Biographical Dictionary is in its field - see my review there!). I use it pretty often and hardly wait for a new edition with new entries, updates, and, of course, some necessary corrections (some of them contributed by me). And mistakes? One of the worst is an article on the Balkans where it's written that Slovenia is part of the Balkans and that it was conquered by Ottoman Turks in the 14th and 15th century. That is simply not true! Slovenia has never been part of the Ottoman Empire. On the contrary - it was a bastion of Christian Europe in the era of Ottoman Turks' expansion. And Slovenia lies north of the line Upper Sava River - Rijeka (Croatian port), which marks the northern border of the Balkan peninsula (compare with my review of Encarta 2003). I think the editors of Merriam Webster should know that. the map shows more than 20 cities and towns, plus South Negril Point, Portland Point, South East Point, Montego Bay (of course), Bluefield Bay, Dolphin Head (1,788 ft), Blue Mountain Peak (7,393 ft), the Blue Mts., Dry Harbour Mts, Pedro Plains, Portland Bight, three named rivers and a passel of smaller ones not named on the map, and Jamaica Channel. There is a very good introduction on map projections, and clear symbols on the maps. 48,000 geographical entities are listed and described. Some no longer exist, but a thumbnail history is given, e.g. Nineveh, Lourenco Marques, now Maputo, the capital of Mozambique. Total of 252 maps, mostly of the countries of the world (with insets to show where the country is located in the world) and the states and provinces of the U.S. and Canada. The map of Japan, where I live, has an inset showing all 47 prefectures, numbered and identified in a list. The only drawback is that the size of the pages is B5. This makes the maps a little small, but they can always be increased in size with a magnifiying glass or a copy machine (being careful not to violate copyright laws, of course). They have such fine detail that increasing the size, say from B5 to B4, does not blur the details. And being the size of a Webster's Collegiate or maybe a little smaller, it is not exactly something you can balance on your little finger, but you could carry it in a backpack or small LL Bean canvas bag pretty comfortably. Finally, any place mentioned in one entry also has an entry of its own. For instance, I looked up Castellorizo, which is the English name for a Greek island that is the last in the Dodecanese chain and actually would logically seem to belong to Turkey from its location. This included references to the Dodecanese and to the island of Rhodes, both of which have their own listings. In addition, there is a bit of history of Castellorizo (and it's various spellings in the appropriate languages) indicating that it had been Greek, then Turkish, then Italian (1923) then back to Greece (1947). Your average atlas won't have that. As I said, it is not a beautiful book and it is not a textbook. But it has helped me many times to find where a place is, even places or areas easy to look up elsewhere but hard to see once you get the map because the lettering is obscured by artwork of brown mountains, green plains and blue lakes. This book assumes that you know that mountains are high, plains are flat and lakes have water in them that looks blue when the sky is clear. As I said in my subject title, this book is the ultimate companion to the Lord of the Rings saga by JRR Tolkien. The Atlas goes into immense details of the maps of Tolkien's Middle Earth, highlighting the journeys of Bilbo, Frodo and The Fellowship of the Ring. It is all done in a very serious, sincere and professional manner, and it is clear that Ms. Fonstad has put a lot of effort into making this book. But like all works of fiction, there are errors, but there are few to be sure. Where these errors arise, Ms Fonstad has made reasonable assumptions or compromises between the conflicting data, but none of them seriously detract from Tolkien's word in any way. As another reviewer said, this is testament to the creative genius of Tolkien, and his uncanny attention to detail that make the books so believable. I highly recommend this book to any Lord of the Rings fan, as it is a fascinating book that clarifies the geography of Middle-Earth in a way that has never been done before. "The Lord of the Rings" and "The Hobbit" are only a small story inside the world of the Ring developed by J.R.R. Tolkien over all those years... A world with its own languages, maps, religion and cultures. No wonder it was great time that an atlas of this imaginary world should be published one day. This book offers a great orientation in everyone wanting to know more about Middle-Earth. If your interest is in the Mythology of Middle Earth, this book with its extensive illustrations and commentary increase your understanding of the story. If you are only passing through the Tolkein universe through the guidance of the films by Peter Jackson, you can be brought further understanding of the depth of Dr. Tolkein's masterwork. I hope you purchase the book, and enjoy it as much a I. Man, what an awesome book! Then I first heard that JRR Tolkien prided himself in his attention to specific details, I was somewhat skeptical. When I found out that Tokien had drawn his own map of Middle-Earth, I realized that the man was an obsessed freak (but in a good way). 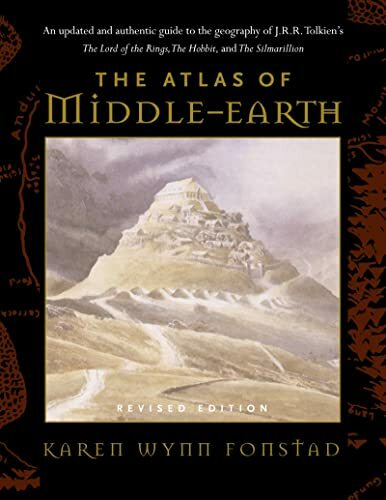 The Atlas of Middle-Earth does live up to it's title as an atlas, providing the proper distance scales, descriptions, and directions (Tolkien had even developed unique symbols for north, south, east, and west). Every place mentioned in Tolkien's works is wonderfully explored in this book. From the plains of Mordor to the halls of Bag End. Even the city of Minas Tirith and the volcano Mount Doom are examined. Fans of The Silmarillion will delight in the maps of Valinor. There are even maps tracking the paths of the journeys in The Hobbit and The Lord of the Rings. This book is an excellent addition to the library of anyone who admires and loves the works of JRR Tolkien. Hands down, this is one of the best atlases I have seen of the Ancient Near East. And it presents the majority consensus of scholars today in terms of geographical distributions, routes taken, culture and history. Just reading the text alone is worth the price of admission. I must confess, though, that I am a map junkie and would loved to have seen more maps. As it stands, however, this atlas still makes an outstanding resource. I simply can't think of a better way to describe it. If you're a serious Bible student, or even a not so serious one, you should defiantly get one. Put it on your Christmas list or whatever, but pick up a copy. The maps are colorful and detailed. The maps also give the viewer a good sense of the elevation changes from the hill areas to the sea-level areas. Different nations are highlighted in different colors, and viewers can see the empires land borders in the different time periods. There are many photos of the land and archaeology items. The book also gives detailed descriptions about what life was like in many of the empires, and how the empires were formed and grew. If you are trying to decide whether to spend the extra dollars for this book: I believe the extras including the map details, land photos, and commentaries on the living conditions and empire developments make this book a much better value than some of the less expensive books, which I like...but the extra details in this book make it more than worth any difference in price. 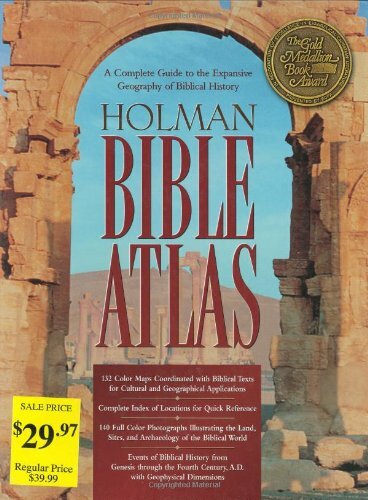 The Holman Bible Atlas: A Complete Guide to the Expansive Geography of Biblical History is worthy of reading in its own right. It is a beautiful and super-informative volume. It is an invaluable tool for using while studying the Bible. I cannot recommend it highly enough. The Atlas is laid out in chronological order. It begins taking a general look at the geography of the ancient Near East. It ends with the expansion of Christianity up to 300 AD. In between these two time periods, the Atlas follows the sweep of the geographical history of the Israelites and the early Christians. Every Chapter is filled with beautiful pictures, informative charts and lists, and excellent maps. I found especially useful the cutaway topographical maps such as the one used to vividly show the course of Joshua's military campaigns. As great as the maps and pictures are...this atlas has a lot more to offer. Each chapter analyzes the economic, cultural and religious practices common in the time periods being discussed. Side bar articles discuss some of these issues in an in-depth manner. In this atlas I found clear, visual explanations of several Biblical topics that had previously been nebulous at best in my mind. The chart on page twenty-eight alone is worth the price of the book. It is the first chart I have ever seen that clearly explains the relation between the Solar Months, the Hebrew Names of Lunar Months, the Feasts and Rainfalls, the Agricultural Activities and Pastoral Activities in ancient Israel. Another great feature of this atlas that I have found useful is the bibliography for studying the topics presented here in greater depth...now I have more books to read! I give this excellent book my highest recommendation. Get a copy today. Magnificent! The Best Bible Atlas Hands Down! I suppose I should preface this review by saying that I am not a former student of Dr. Brisco as the other reviewers were. Therefore, I can assure you that I don't have a prejudicial view of the work. But I can agree with the previous reviewers by guaranteeing that this Bible Atlas is, by far, the best in its class, offering extensive coverage of both the social and physical geography of Palestine and the Near East for a very afforable price. The grahpical quality of the maps and visual aids are simply stunning and unsurpassed by anything else out there. The only Atlas that comes close to this work is Zondervan's NIV Atlas Of The Bible by Rasmussen. Nothing else should even be considered. If you can have only one Bible Atlas, this is the one you want! Don't waste your time searching for anything better! I use this book occasionally, but it is lacks the detailed for use by itself. Where I do use it is with mapquest, that tends to not show the smaller lakes, but the Gazetteer does a much better job. This is the second Delorme Atlas I have purchased and it contains a wealth of information regarding lakes and rivers for fishing. Secondary roads are clearly marked, as are boat ramps and launching areas. Many lakes are identified as to species of fish that are there. I would recommend it to anyone who wants to locate fishing areas throughout the entire state. While many of the smaller roads are not identified, it shows enough information to be able to get where you want to go. My only advice would be to label more of the smaller roads leading to the lakes. 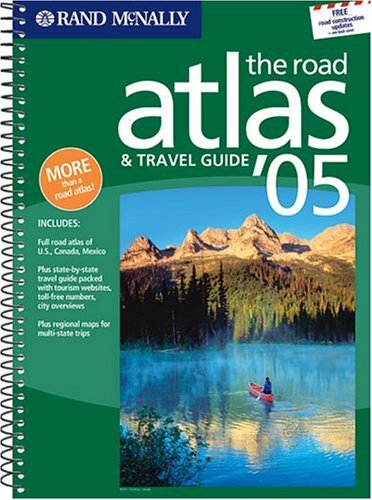 This atlas is as useless as the state of Florida. Both the altlas and the state can drop off the face of the earth. 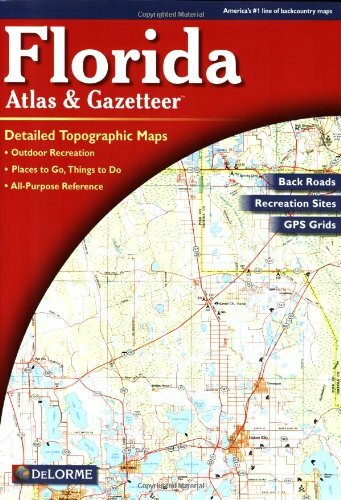 I just bought the 5th edition of this Delorme Florida Atlas. However, the Florida atlas does not include the Section, Township, & Range system that Florida County parcel # real estate legal descriptions are based on thus making this atlas useless to the real estate/surveying/flood zone determination industry. The Section, Township, & Range system is especially useful when you are dealing with new construction that aren't on any maps yet, or with incorrect/incomplete addresses. With the STR system you can get the location narrowed down to a one square mile area. This lack of STRs was surprising to me because I recently purchased a Wisconsin Atlas by Delorme that had STRs in it & it was very useful. This was a major mistake/oversight on the part of Delorme & I am returning my copy to the map store tommorrow. Hopefully, they will correct this error in the sixth edition. The challenge to understanding history lies in the tendency to focus on single scenes instead of the big picture, akin to looking at a tapes-try by examining individual stitches instead of the entire design. The Atlas of World History undertakes a fair-minded journey through the human story by mingling close-up looks at events with broader views of what was then happening elsewhere in the world. Each of this book's six sections, arranged chronologically, opens with a world map that shows developments at various points of the compass, along with an essay about what was happening and why. Cross-cultural time lines run through the book like a thick thread, tying all of history together. Thus, as one reads a section on Charlemagne, for example, the time line shows selected events happening in Nubia, in India, in China, and in Cyprus. The text by author Noel Grove, a staff writer for 25 years with the National Geographic magazine, continues with a world-wide perspective usually ignored in works of history: "By A.D. 100, when the Roman Empire was in full swing, some Maya cities were already in decline." Events are examined for their local as well as global impact: "Great empires butted heads and power changed hands, but these episodes fed a...kinship with a wider community." Here, then, as Daniel J. Boorstin says in his foreword, "...is an invitation to discover both the mystery and the miracle of human experience on our planet," as Grove shapes complex history into an understandable tale with a storyteller's eye for little-known details: "Russia's...Peter the Great died at the age of 53 after diving into the Neva River in winter to rescue drowning sailors." And "Vikings were not just ruthless killers; they traded as often as they raided, and their wives knew rights that other medieval women could scarcely imagine." I give this book four stars because, while it is really not an atlas, it is a wonderful overview of history. The book features the superb photography/illustrations that folks expect from National Geographic. These graphics are used to good effect, showing the progression from early history to the late 1990's. I find it a most enjoyable "refresher course" in world history. There is a timeline at the top of each page indicating significant events for the given period. If you wish to have a succinct world history summary/review with great aesthetics, you can't go wrong with this. However, it offers relatively few maps (around 60 or so), so don't depend on it as a true atlas. I've been on an ancient history kick lately, and since it's been about 20 years since I've done a lot of reading in this area, I thought I would check out what's available in the way of good historical atlases of the ancient world, or of world history in general. 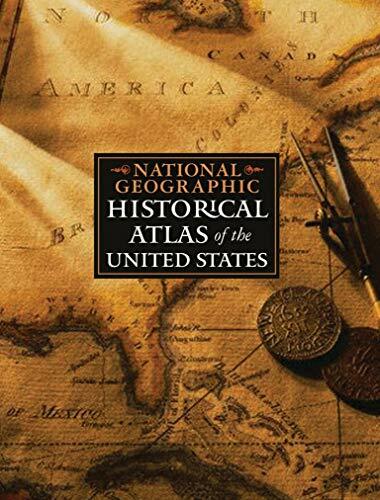 This book is one of the half-dozen big atlases out there that are available. Since I've been looking in detail at all of the current ones, I'll give brief comparisons and you can go from there and decide which one might be best for you. Atlases are great for looking up those events, both momentous and not-so-momentous, to get a quick grasp and overview of the situation without getting bogged down in some more detailed and ponderous history. All the current ones do a decent job of that, but they very in terms of readability and the number of maps included, and the degree to which they integrate the visual maps and materials with the text. Here's the scoop on all of these. 1. For my money, John Haywood's Atlas of World History is the best combination of features and price. Haywood writes very well and has a nice, deft touch with the material, unlike many atlases, whose prose often sounds somewhat dry and technical. The book was written along with a team of graphics experts skilled at combining the written word with maps and illustrations, and it shows. Although not as large as the Hammond and Dorling-Kindersley books, it's still excellent and only a fraction of their cost. Two other nice features are the color-coded timelines which accompany each two-page spread, and the many special symbols and legends on the maps, which are used to illustrate and highlight points in the text. 2. The Oxford Atlas of World History is also well written, and has lots of maps just like the Haywood volume. I found the writing style somewhat drier than Haywood's, but it's one of the most scholarly of the atlases out there, and could be used by college students given the level of presentation of the material. These two books are otherwise very close, except that the Haywood volume is less than half the price of this one. 3. The Nat'l Geographic offering has some of the most entertaining writing by Noel Grove and Daniel Boorstin I've found in any history text. Some of the tidbits are really great, such as Grove's comment that "Russia's...Peter the Great died at the age of 53 after diving into the Neva River in winter to rescue drowning sailors." And "Vikings were not just ruthless killers; they traded as often as they raided, and their wives knew rights that other medieval women could scarcely imagine." However, the main shortcoming of this atlas is that it contains almost no maps. Most of the illustrations are arts or crafts related, for some reason. In that sense the book hardly qualifies as an atlas, and it would be more accurate to say it's a more like a well-illustrated history of the world, instead. 4. The Hammond Atlas, along with the DK, is physically the biggest, thickest, and most comprehensive of the 6 discussed here. It's also the highest priced, and more expensive than the cheapest one here by a factor of four or five. It's still a fine atlas despite the cost, and I'd still be quite happy with this one as it's certainly a beautifully done atlas. The book has over 600 maps and illustrations, many of which show such nice details (which not all the other atlases do) as mountain ranges, and in general are beautifully colored with a variety of symbols showing movements of peoples and armies and other important historical and cultural details, similar to the Haywood volume. The level of presentation of the material is also high, and would be appropriate up through college level, but the prose style is a little drier and more technical sounding than the DK or Haywood, for example. However, someone who is already pretty knowledgeable about history could probably still use this atlas, compared with the DK, which, although more attractive graphically, is obviously aimed at a broader audience. 5. The Dorling-Kindersley atlas is the most beautifully designed, graphically, of all the offerings out there, and they often set the maps at various angles or distort them in creative ways to fit all the different paragraphs of text and illustrations on a page, which sometimes looks a little weird. Because of this, the presentation consists of an introductory section in larger type, with other paragraphs in smaller type which are paired with the other maps and graphics on each two-page spread. In fact, there is almost a 1 to 1 correspondence between the illustrations and the text paragraphs. I found this made the atlas harder to use than the others, since the pages are almost so dense and busy with material that it's almost distracting, but there's no doubt it's the most visually appealing and graphically innovative of all the atlases out there. Their maps are really spectacular, and they use the glossiest paper, so their maps look more attractive. The DK atlas also provides the best coverage of non-European history, doing a much better job of covering Asia, Africa, South America, and Oceania. The other atlases are more Eurocentric in their focus. Next to the DK, the Hammond atlas provides the best coverage in this regard. 6. The last atlas I wanted to discuss is the Times Atlas of World History. Although now a little dated, having come out almost 10 years ago in 1993, it still counts as one of the mostly scholarly, well-written, and well-illustrated of these works, and it's also intermediate in terms of price. I read somewhere that the more recent Hammond atlas is actually this one updated, but they don't state specifically that the Time atlas was its predecessor, so I can't verify this. Hope my little "Consumer Reports" comparison guide helps. Good luck and happy atlas shopping, buying, and reading! I had to get this book, as I love National Geographic feature maps. Once I acquired it, however, I was shocked to discover how few maps are provided by this book. Furthermore, I am usually disappointed by this book when looking for specific events, dates, and locations. Help me recover my dignity as a consumer and buy something else! I teach world history and own several world history atlases. Of all the world history atlases that I own, the National Geographic Atlas of World History is the most Eurocentric and least useful. Surprisingly, this is an atlas with many beautiful photographs, but relatively few maps. It reads more like a beautifully illustrated world history text for a middle school or high school student than a serious world history atlas. If you are shopping for a world history atlas, I would recommend the DK World Atlas, Oxford (Philip's) Atlas of World History, or the paperback Hammond (Times) Concise Atlas of World History. 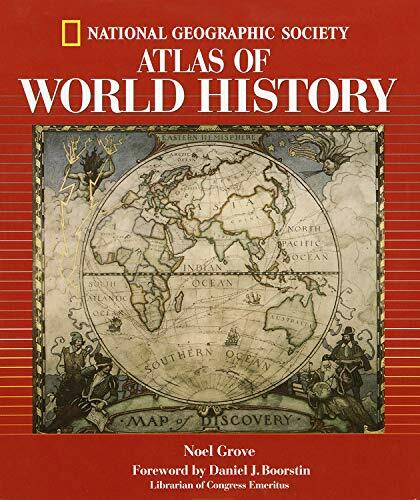 For what it's worth, the now dated 1993 Times Atlas of World History remains the standard by which all one volume world history atlases are judged. The way that one's goes travelling throuh the history with this book is nothing less than outrageous! This map is accurate and laminated, which makes it indestructible. It is a good value and easy to read. I essentially walked most areas of Rome and found no errors...it got me back to my hotel every time. An excellent buy! You can find an official (and free) map and important extra documentation at the Tourism Office of all European cities you plan on traveling to. These offices are right at the Train station or Airport. Even your hotel concierge will provide you with a decent map. - Metro lines not drawn out, just stations. It helps to see the actual metro line when you are looking for other stations along your line. - Map is a bit too shrunk down for some cities: street names are too close together and hard to read. - No vaporetto lines for Venice. ... but the map is better than nothing. I don't think you need it if you can spend the 5 minutes to stop at the Tourism Office. 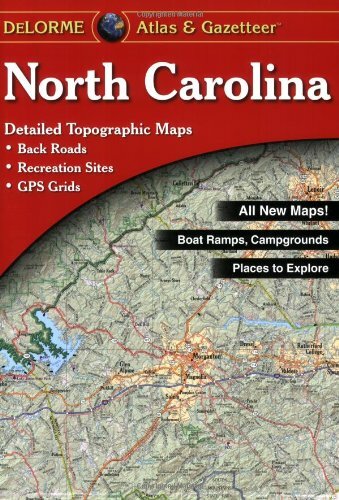 I am a full-time fishing guide in the mountains of North Carolina and I have found this book to be the absolute best reference material for finding trout streams in our mountains. If you do any type of outdoors activities you will benefit from this book. When I first picked it up I couldn't believe the detail. A real page turner. From Nag's Head to Asheville, its a book I just couldn't put down. I own several of the DeLorme state atlases. They are great resources for the planning of non-motorized touring (biking, hiking). Strengths include: (1) Physical land features: topographic contours, water resources, vegetation, etc. (2) Off-road options: trails, abandoned railroads, ferries. (3) Recreation: Parks, outdoor sports, points of interest. DeLorme's atlases have two shortcomings: (1) Road naming is too creative. Many of the printed names bear no relation to actual road signs. (2) There's no indication of whether a road is paved, gravel, dirt or sand--every road is shown by a thin, red line. Consult "The Roads of North Carolina" for pavement info. All in all, a "must" for the do-it-yourself traveler. This map book has really helped me to get to know my state. I love this map. I always take it with me when I go anywhere in Colorado. The scale is small enough so that you can see all the little back roads, and it's pretty easy to read. 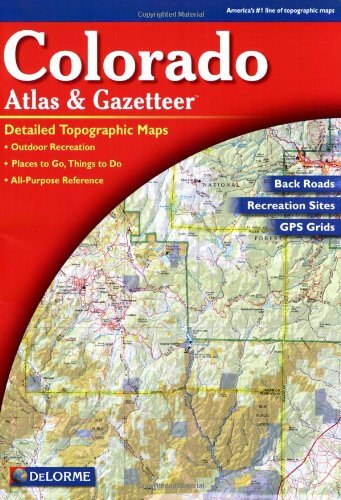 You should receive the sixth edition (2002) of the DeLorme Colorado Atlas & Gazetteer when you order from Amazon, even though Amazon's listing still shows only the fifth edition (2000). The atlas is indispensable if you're planning to travel on the back roads or the major Forest Service or BLM roads of Colorado. Governmental jurisdictions are well-differentiated by color, and the topographic relief is very nice. The only caveat is that the scale of the maps in this atlas, at 1:160,000, is too large to show great detail. If you're mountain biking or hiking in remote terrain or on minor trails, you should get additional maps, such as smaller-scale governmental maps or those made by Latitude 40. It was this book that first convinced me to buy a GPS. We were out 4-wheeling in the Colorado backcountry and met another 4-wheeler. We were looking at his Colorado Atlas and disagreeing at which trail intersection we were at. He pulled out his GPS and said he would settle this. The GPS with the Colorado Atlas proved us both wrong. I went back to town and bought this book and a GPS. This is a must have if you travel the back contry. 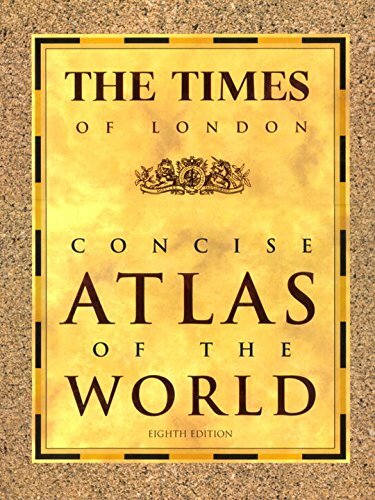 The Times of London Atlas of the World has long been famous for its authority and for setting the standard in world reference atlas publishing. 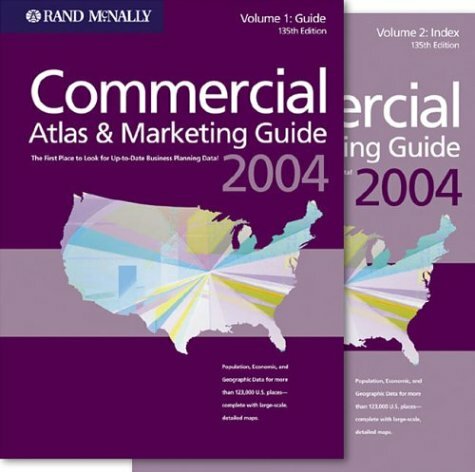 This eighth concise edition is a completely new atlas in that tradition, redesigned, updated, and expanded. * The 260 pages of mapping, with new reference maps that are completely up to date, include even more information at larger scales than previous editions. * Employing the latest technology, each map is individually designed to use the optimum parameters of scale and projection for maximum legibility, clarity, and accessibility while providing detailed information on the physical and human landscape. *Each map has been carefully selected to provide balanced coverage of all regions of the world with larger scale mapping of more populous areas. * A new introductory section, The World Today, includes stunning high-resolution satellite images of the continents, features on the planets, earthquakes, volcanoes, the oceans, climate, land cover, population, urbanization, minerals, energy, and communications.This section also includes a complete guide to the states and territories of the world with all of the latest data and statistics. * Thirty-two detailed plans of the world's great cities are provided. * An information-packed guide to the states and territories of the world is included. Excellent for crossword puzzles! Load of references, easy to read (no blue on blue), no pages wasted on United States individual state's maps. One test we used in looking for an atlas was to see if Palau was shown -- this atlas passed with flying colors, showing the individual islands. Exactly what we needed as a great reference. I was looking for an Atlas that was both complete in world info covering and not expensive at all. I also definitely had to seek well-known sources which provided me accurate and meticulous advice so that I could find what I was expecting. To make the decision for the purchase of The Times of London Concise Atlas of the World (TLCAW) I must say that, as usual, I considered "surfing" amongst some "world atlases databases", which fortunately clarified my first impressions. I'm delighted to say that by using this info I came across that TLCAW is the perfect combination of a convenient price and incredibly stupendous data. And is also renowned as one of the best atlases ever published due to its unusual accuracy. Along with this "advisor", I had to set my final word because this kind of publication should become a "world consultant" for the owner and, of course, your "investment" should be guaranteed with an outstanding product. What's more, I had previously checked info from another The Times Atlas when it was supplied in little tomes -7 or 9 years ago, when I'd just entered university- if you acquired a local newspaper. Its wholeness astonished me, and currently I can undoubtedly confirm that TLCAW is the most intelligent purchase of a publication I've done since then. A superb hard cover, luxurious paper, an adequate and handy size, stunningly wide info of every part of the world (including villages! ), completely detailed photos (and several high resolution satellite ones), an interesting thematic section, an invaluable segment: urban center maps of the 32 most populated cities, suitable subtle color usage in maps and an astounding level of entries for its price level (about 125,000) make The TLCAW the best option for an Atlas ever. Highly recommended. Excellent value. Impressively worthwhile. One of the best atlas's I have seen. Excellent satellite images & detailed thematic maps. Almost a work of art. Well worth the price. Geography on paper at its finest. Stuffed with incredibly accurate information. Of the dozens of recent world atlases that I have seen in the past seven years, this one overall speaking offers the most value of all. This world atlas is advertised as "an abridged version of the famous Times Comprehensive Atlas of the World", but it is absolutely more than just that. 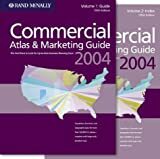 Without doubt, this 8th Concise edition is by far the best rendition of the world on paper available in 2000 (fully generated from digital GIS databases). New maps in this set of unbelievably accurate plates include central Japan, the Washington-New York area, and Central Mexico. Also, urban center maps of the world's largest cities have now been included on the reference maps themselves, something that is missing in the Comprehensive edition. The color coding has improved considerably compared to previous editions; though not completely consistent overall, most maps are beautiful to look at, and provide for a very high level of legibility because of the subtle coloring (no relief shading, but layer tints are used, which reduces the 3D effect, but does add to the overall legibility of the maps). The font sizes have been reduced too, allowing for the available space to be used much more efficiently (though some elderly people may find the fonts too small). This results in an index size of over 125,000 entries, which is absolutely stunning for a world atlas of this size (the nearest competitor reaches 112,000, most are stuck at 100,000 entries). The maps include many local roads, points of interest, national parks, nature reserves, and, amazingly, lots of villages with a population of less than 1,000. The thematic section has been expanded as well to include highly detailed satellite images of the continents, topics such as earthquakes, volcanoes, climate, oceans, population, urbanization, and modern communications. There is also a nice section on revolutions in cartography, comparing the time-consuming process of using copper plates for map production to the current digital database possibilities. There is also an elaborate section on the states and territories of the world. The atlas also has a few minor negative points: the gutter between the pages is sometimes so small that some data is lost between the pages; and, the focus is mostly on Europe; especially North America should have deserved a bit more attention. The twentieth edition of Goode's atlas of the world continues to be a standard for U.S.-educational purposes. The reference maps themselves are not too accurate and detailed, but they provide a reasonably well-balanced coverage of the world, with handy larger-scale inset maps for the more populous regions of each continent. There is an elaborate thematic section on a variety of topics about the world, the continents, and the United States in particular. This is supplemented by a very good statistical section, and the 30,000 entry index gazetteer contains a pronunciation guide for each entry, which is unique for a world atlas. Non-US buyers probably have better alternatives, but for school purposes for North America, this is a very good choice. The publication of this twentieth (!) edition illustrates the endurability of this work since 1922. 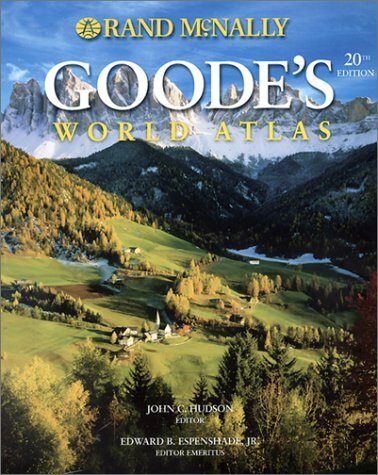 When I took my first college-level geography class, my professor told the class that Goode's World Atlas is the best atlas on the market. Fifteen years and a couple of editions later, it's still the best atlas I've ever seen. The atlas includes a commendable section on map projections, many excellent thematic maps, easy-to-read regional (general) maps, tables of country and landform sizes, and a wonderful index. If you're looking for a road map, this atlas probably won't help. If you want to learn about the world, or teach school-aged children about the world they live in, then this is one of the top resources out there. 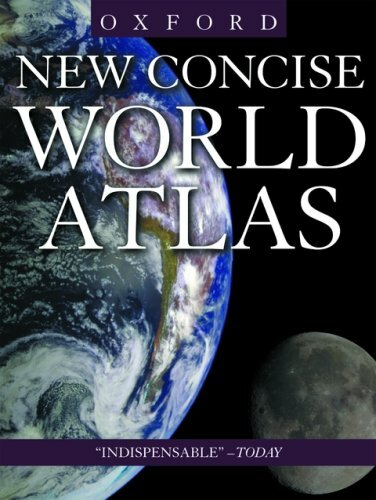 The atlas is U. S. centric even though the title is 'world atlas'. The map of the U. S. takes up about 25 pages, while the map of Italy, Greece, Romania, Bulgaria, and Yugoslovia (formerly) take up 2 pages. And the spelling is unbelievable. Many of the place names are rendered in the native language instead of English, at least I assume so. North and South Korea, about the size of Kansas is shown at about 1/2 the size of Kansas. One normally buys a world atlas to learn about the world, not the U. S. A disappointment. I've been using this since the 17th edition. if you want to impress people with pretty maps, skip it. Road atlases are for family vacations. 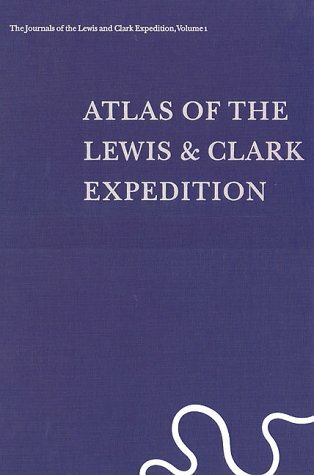 if you have a child in school, and you want to get them the best reference atlas in the US, then this is it. Don't be put off by the large index and odd-looking maps in the front- they all contain valuable information. I learn something new every time I open this book up.